The Plex Vision Outdoor A-Banner offers a better class of A-Banner! A-Banners are an extremely effective way of getting your message across outdoors, whether that’s teeing off at the Golf course, browsing a summer fete, wandering around a stately home, taking in the vibes at a music festival or simply wanting to know the way into a car boot sale! However not all A-Banners are created equally! Whilst most A-Banners use a push-fit method of assembly (with the graphic bungees essentially keeping everything together) the Vision’s screw-fit assembly, together with quality aluminium cross-bars and legs, and new steel leg rigidizing plates, results in an altogether more solid frame. This extra strength has not come at the expense of versatility though, a quick loosen of just two thumb screws enables the unit to be folded back on itself, making storage of the unit quick and easy when required. The standard size Vision has space for a single 2m (w) x 1m (h) eyeletted graphic and a double-sided option of this is available, as well as 3m wide single and double sided versions. 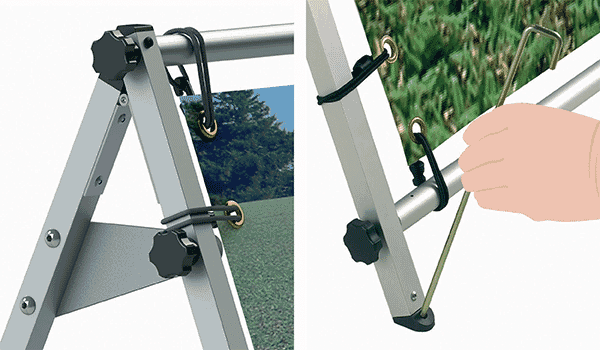 All Vision systems come with bungees to secure your eyeletted graphic(s), along with ground pegs to anchor it in place if positioned on soft ground. For use on hard ground then something like our Cyclone/Polar weighted base ring can be filled with water and then laid across the bottom bar at each corner (in the space between graphic and frame) to help keep it in place. An optional carry bag set to hold the system and graphics can be purchased separately to take the system from one event to another if needed. So if you visualise a sturdy, versatile, long lasting, value for money A-Banner try focusing in on the Plex Vision outdoor A-Banner stand.